MFM FC striker, Stephen Odey has affirmed his commitment to respect his contract with the NPFL club side. The current top scorer in the Nigeria Professional Football League, Stephen Odey has denied reports suggesting that he is set to go on trial in Belgium. Odey with 14 goals to his credit is topping the goals scorers’ sheet in the NPFL. 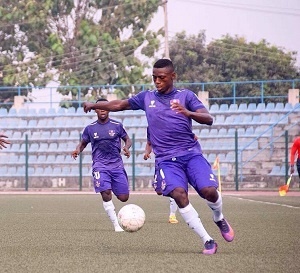 The MFM FC player claims he is focused on his present task with the Olukoya Boys. ”As you can see, I’m still here with MFM FC, I want to play here and improve my game. I’m not bothered about such talks.” Odey said on a radio programme monitored in Lagos. Odey in the penultimate weekend had a chance to showcase himself to the Super Eagles Coach, Genort Rohr who watched MFM FC trounce El-Kanemi Warriors in one of the Match Day 18 games. Though Rohr has not ruled out an invitation for the Lagos-born forward, some observers feel his chances of beating the competition of Man City’s Kelechi Iheanacho or CSL based duo of Brown Ideye and Odion Ighalo are slim.